Join us this December for a fabulous Christmas party on the fashionable Kings Road, with your friends, family or work colleagues, and enjoy a delicious 3-course lunch or dinner, with all the trimmings in the stylish surroundings of our exclusive Private Members Club. Or why not book a drinks and canapés party up in our Penthouse Champagne Bar for that real WOW factor. 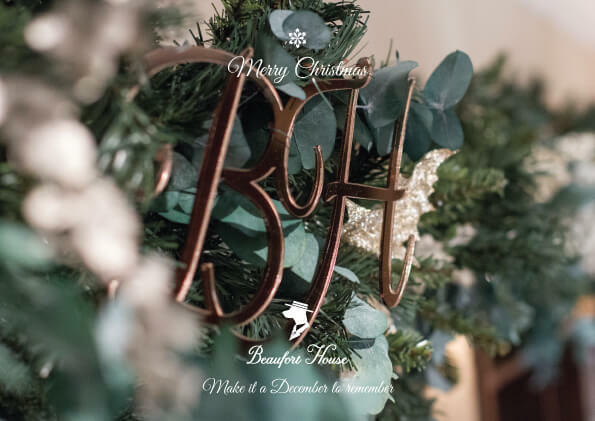 Beaufort House is one of the most stylish Christmas party venues London has to offer. Each one of our rooms has its own private bar and can be booked exclusively for either a sit down meal or for drinks and canapés. We have three unique & exclusive rooms available to book for private events. Our Members Lounge is suitable for either Christmas Dinner for up to 100 or 180 for drinks and canapés. Our stunning Club Room can accommodate up to 30 guests for dinner or 60 guests for a standing reception. Alternatively, why not host your Christmas party in our penthouse Champagne Bar for a taste of exclusivity and glamour. Invite 100 of your nearest and dearest for drinks, canapés and dancing, or have a more intimate sit down dinner for up to 50. Our dedicated team of Event Managers are here to guide you through the organisational process, working alongside you every step of the way and offer excellent, personal service from start to finish. From your initial enquiry and quotation through to the event itself, we aim to build your perfect Christmas celebration with all your requirements delivered in style at this stunning venue in the heart of Chelsea. Bookings are now being taken for parties throughout December 2016. Call our Events Team on 020 7352 2828 or email events@beauforthousechelsea.com for your bespoke proposal.